The UK had a very warm November and December - plenty of flying days, with bees very active and stores being consumed at twice the normal rate. The mild weather continued into 2018, with two nights in the last week of January seeing an extraordinary 15C (59F) overnight. I suspect that two of my colonies had started to brood-up by then, as their top boards became very warm to the touch. Then - a day or two later - someone up there in the celestial sphere flicked a switch, and it's been brass-monkey weather ever since. Heavy frosts every night, with temperatures hovering around zero(C) during the day thanks to strong winds from the North-East bringing freezing cold air in off the North Sea. Currently there's one hive here on 'full life-support', with half-a-dozen others living on emergency supplies of fondant, and the rest must surely be close to exhausting their stores by now. However, with the commencement of spring just a week or two away, I felt reasonably confident there was no need to start chewing my fingernails just yet ... that is, until the weather forecasters announced that we can now look forward to one or perhaps two weeks of blizzards arriving straight from Siberia. The current predictions are temperatures as low as -15C (5F) in places, with some 8" of snow, which may not sound a whole lot to some of you guys who get plenty of snow each year, but this is predicted to be 'dry snow' and will have gale force winds behind it, so I'm guessing there'll be snow-drifts a few feet deep in places - which should prove interesting. Here's a map showing the areas of 'Amber Alert', with the position of Yours Truly (wouldn't you know ... ?) well inside the envelope, on the tip of that red arrow. Welcome the snow. It will save your bees from the cold wind. And as we say in the north provide poor man's fertilizer for the wild flowers to grow. I welcomed the warm freaky weather we got this winter but it could result in the end of my hives. Hang in there LJ. As long as your bees have supplies, even emergency supplies, they will be fine. Warm weather and no food is what messes my bees up the most. The snow in my area arrived a day early - about 3-4", very powdery and dry - but there was precious little wind. At that point I didn't really understand what all the fuss was about. Tuesday and most of Wednesday were very curious days. In this area, snow kept falling, again with no wind, but the 3-4" level of snow didn't increase much as the sun made a brave attempt to melt this unwelcomed visitor - which resulted in the formation of icicles in the sub-zero temperatures - some of which grew to over a foot long. By this time, the Amber-Alert areas had migrated up past the North of England and into Scotland, where they were raised to Red-Alert - the highest warning category (immediate risk to life etc). But from late Wednesday onwards, I began to understand the significance of these warnings. A gale abruptly arrived from the East, causing complete a wipe-out as it picked-up the powdery snow and drove it along on it's high winds. It was (and still is) just like a sand-storm in the desert, only it's snow and not sand. Visibility down to 10 feet or less. Never seen anything quite like that before. Ambulances have been doing a roaring trade - that is, when they can get through. 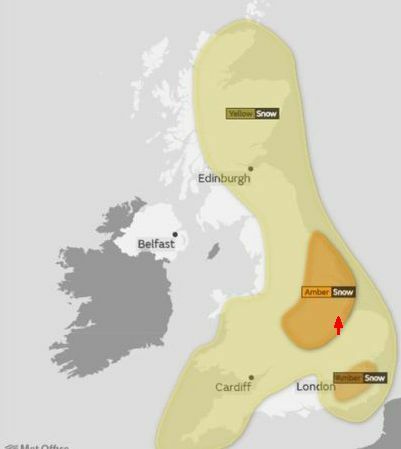 Today - Thursday - the Red-Alert areas have been extended down into England as well. No trains are running north of Newcastle, all airports and schools in Scotland have been closed. Reports are coming in of hundreds of people being trapped for 18hrs in sub-zero conditions on a Scottish motorway, while attempting to drive just 20 miles along it. Total, utter bl##dy chaos as the country slowly grinds to a halt. As regards bees - I'll be more than happy if even half of mine survive this lot. These conditions are set to continue for at least another 3 days in this locality - but far worse and for far longer, North of here. In this area, snow kept falling, again with no wind, but the 3-4" level of snow didn't increase much as the sun made a brave attempt to melt this unwelcomed visitor - which resulted in the formation of icicles in the sub-zero temperatures - some of which grew to over a foot long. By this time, the Amber-Alert areas had migrated up past the North of England and into Scotland, where they were raised to Red-Alert - the highest warning category (immediate risk to life etc). But from late Wednesday onwards, I began to understand the significance of these warnings. A gale abruptly arrived from the East, causing complete a wipe-out as it picked-up the powdery snow and drove it along on it's high winds. We call it a "white out". It is quite common here for any road that runs due north and south because our prevailing winds are westerly. Trains are not affected by feet of snow. There is no wind capable of blowing a train off its track in our area. Airports close down because of wind not so much due to snow. We have equipment to clear feet of snow. 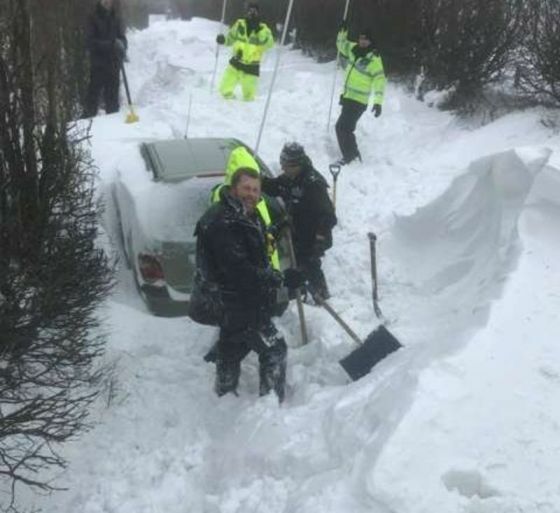 The single biggest problem we have here with bad weather is the old people who can't see, take about 20 pills a day and have zero driving skills will be the first out on the roads trying to prove something. It makes travel in the slightest form of bad weather very frustrating and dangerous. Apparently it's not the snow specifically (although that certainly wouldn't help any) which has grounded the trains - but the icing-up and jamming of points due to the partial melt in otherwise freezing conditions. Hey john we got Friday's weather warning today. It is now 41 degrees and not a flake on the ground except for piles from commercial parking lots. The past warm weather has melted it all. Friday through Saterday will be 6-12 inches in my area, 6-30 inches on tug hill just a ways north of us. There will be some white outs in this storm for sure. What I don't like is it is going to start as rain and then switch over. When that happens it usually means a layer of ice underneath the snow fall and that is a killer. A state of emergency will be called which means you are not suppose to go out on the roads. Undoubtedly, idiots will venture out. The ones who don't know how to drive or have a vehicle with questionable tires and get stuck. And that presents a huge problem for the snow plows (when people are still in the vehicle). If the person abandons the vehicle it is fair game for the snow plows and the driver can have some fun. Nothing is more unpredictable then our weather here. I have been told that it is a training ground for meteorologist. I guess the big difference between what's currently happening over here and what happens in parts of north America and Canada, is that you guys are fully geared-up for it. You will have suitable snowploughs and an infrastructure which is tailored for this kind of event every single year. Whereas for us it's a 'once every 20 years' type of scenario. Which means there's no real case for having dedicated snow-clearing equipment sitting unused in sheds year-in, year-out. So - what we tend to have is just converted lorries (trucks) - which are pretty-much standard vehicles, just fitted with a mickey-mouse snowplough blade on the front and a grit (brown salt)spreader on the back - when what is really needed are snow-blowers. http://www.bbc.co.uk/news/uk-43236763 As you will read on that page, as a country we just don't cope too well with conditions which you guys on the other side of the pond would consider very much par for the course. Most definitely John it is the equipment and the mountain of salt stockpiled near and around every major highway. Plowing is the fastest way to clear snow. Snowblowing is at a snail pace. You got to have horses and weight to push snow though. Construction equipment is slow too but necessary when you lost the battle with a plow. LJ, my sister lives in Chard and they shut down the road through town. Last I heard they were upwards of 6 in on the ground and below freezing temps. Some years ago over the objections of her husband she made him buy some chains for the car. They have come in handy a few times! There are no plows, sanding trucks, etc. She has much the same weather pattern I have in Oregon and we just went through the same. Some years ago over the objections of her husband she made him buy some chains for the car. They call it a bomb cyclone ... got us good. That 6 inches they forecast turned to 22. Major flooding on the coast. Thursday, not a flake of snow on the ground. Highways are back to bare pavement today. This weekend here in the South East looks like the start of a decent two weeks of sun. I'll be setting up my queen rearing kit Saturday and hoping for the best. If so - yes indeed. For those overseas (from us) UK weather has been really weird this winter - temperatures up and down like the proverbial yo-yo. A week or so ago a short heatwave - temperatures higher than we normally get in high summer, then cold again with continuous rain, and this weekend we're due for yet another heatwave. Something very odd is going on. By using a controlled 15W heater-frame I was able to keep the hive temperature up to around 25C at all times, except during the two Siberian blasts we had, when it dropped to 15C with the heater on 100% of the time. This 'life-support' was in place from mid-January through to mid-April, when I was finally able to transfer the remnants of this colony from a dummied-down hive (the largest size I currently have here, at 16 frames of 14x12), to a more suitable 5-frame nuc box. Our weather today was perfect, and so I was able to make a detailed check - and she's now produced two frames (four sides) of CD-sized capped brood, with a smattering of BIAS where some bees have already emerged. I was half-expecting to see tell-tale signs of a drone-layer - but so far so good - and with a bit of luck she'll keep going for a couple of weeks more before her inevitable supersedure.